Session information for the 2016 CIRR Conference. More sessions, presentations and speaker bios coming soon! How might we create the opportunities for literacy to happen authentically throughout the day in multiple contexts and in multiple places? How can we be flexible about where we are meeting with the children, how long we are meeting with them, and what level of support we are providing to them? As we reimagine literacy instruction, we will use video clips to hear educator teams making the learning visible by noticing and naming literacy behaviours that are connected and applied in multiple contexts throughout the day. Beginning readers do best when they are engaging with books at a ‘just right’ level of difficulty – books that offer opportunities to both consolidate what is known, and do some new problem-solving. However, not all levelled texts are created equal. Understanding the characteristics, function and limitations of levelled text enables teachers to maximize the learning impact of this valuable instructional tool. Susan Burroughs taught K-3 for many years, worked as a Reading Recovery Teacher Leader for 18 years and retired from the Toronto District School Board in 2012. She is currently Executive Director of the Canadian Institute of Reading Recovery. This workshop will provide participants with an overview of the Full Day Kindergarten Planning Time Framework currently being implemented across the Hamilton Wentworth Catholic District School Board. This session will discuss the process that occurred to design this literacy-based framework that includes explicit lessons and procedures, the implementation and professional development plan, lessons learned from the field and current successes in literacy achievement for the board’s youngest learners. Participants will also receive a copy of the detailed framework and links to the various support resources. Judy Eaton: Judy has been a teacher for almost twenty-five years. She has taught in all divisions and has been a Literacy Coach for HWCDSB. She is currently the board’s Literacy Consultant, serving all staff, Grades 1-8. 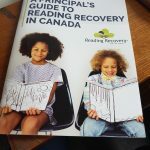 Judy also teaches Reading Part 1 through Brock University and has been instrumental in developing key resources that are currently serving the entire system. Judy is a wife and mother of three daughters, ages 17-20 and an avid runner in her spare time. Dean Younger: Dean has been a teacher since 1987. He has taught in all divisions. He was a Reading Recovery Teacher Leader and the board’s Early Years Consultant and Early Years Lead throughout the Full Day Kindergarten revolution across Ontario. He is currently Principal at St. Thomas the Apostle CES in Waterdown, Ontario. He is the father of three children, ages 22-26 and is an avid camper in his spare time. Clay states, “The child’s brain is excited to find what it already knows in a different setting.” This session focuses on learning how to search for links to the known in moments of problem solving with implications for teaching. Literacy Lessons Designed for Individuals Part Two sections 6, 11, and 12 will be our references. Running Records capture what young readers say and do while reading continuous texts. Observing and recording how children problem solve begins with the easy-to-notice behaviours and changes over time. As children’s processing changes from week to week what progress can be observed and how can teachers foster this change? Discussion will be centered on the interpretation of Running Records and how these records can challenge teachers to think about children’s processing. Yvette Heffernan is the Reading Recovery/IPLÉ Trainer for the Atlantic region, where she supports implementations in both English and French. She has been a classroom teacher for 34 years as well as a school administrator. Her experiences as a French Immersion, Core French, Resource and Early Intervention teacher continue to shape her work with both students and teachers.